It's time to take a look at all the challenges for Week 7 of the Season 8 Battle Pass! 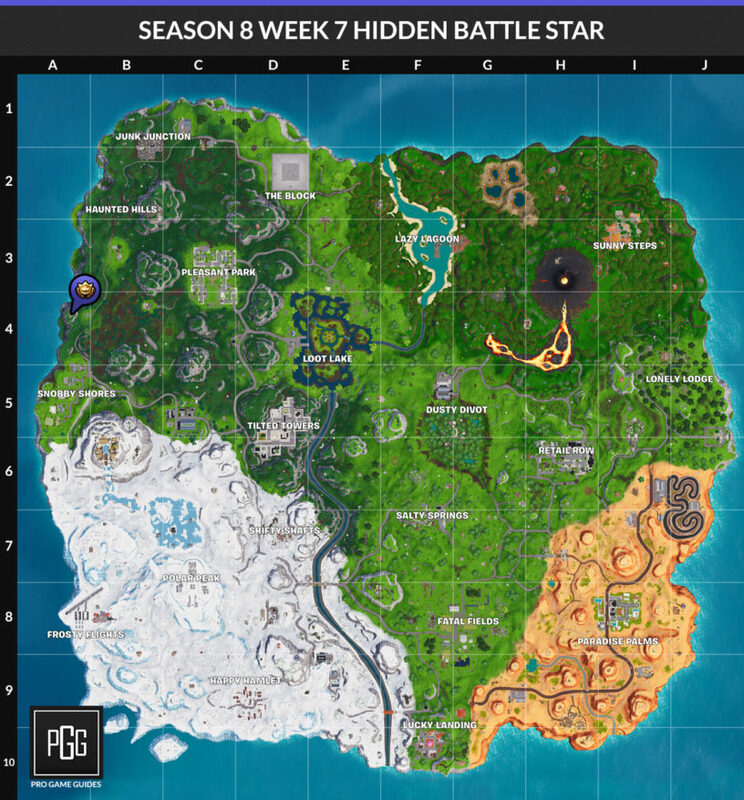 Our Fortnite Season 8 Week 7 Challenges List and Cheat Sheet brings you all of the solutions and answers for the challenges you need to complete for the week. We have maps to treasure and item locations, as well as tips for completing all of them as quickly as possible! This week we're dealing damage with a pickaxe to our opponents, visiting Pirate Camps in a single match, visiting various areas in a single match, dealing damage to players that are above us, searching chests at Loot Lake or Snobby Shores, dealing damage on ziplines and enemies who are on ziplines, and eliminating opponents in different named locations! 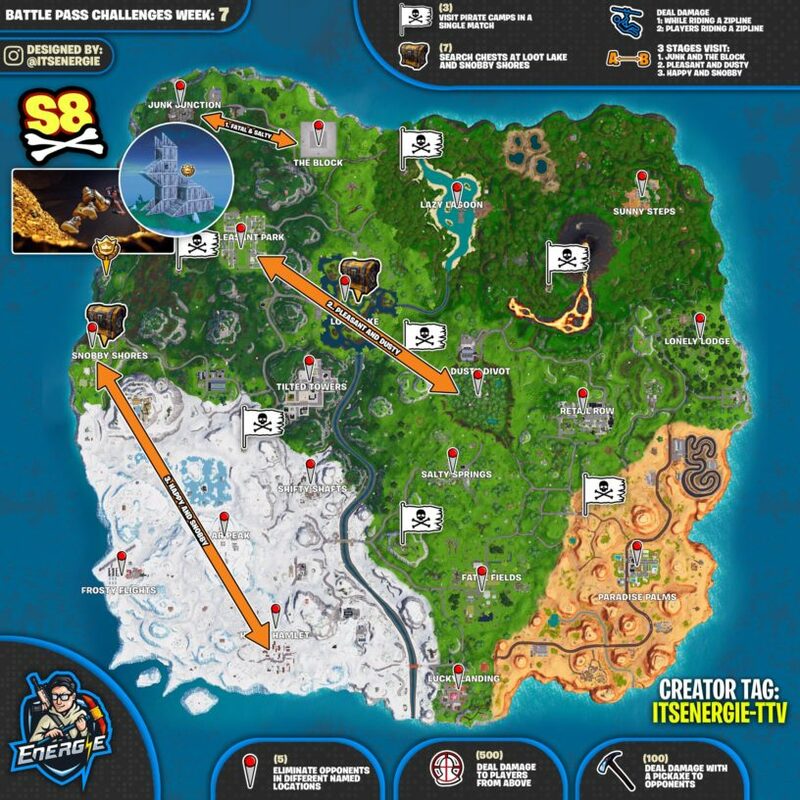 Here's a cheat sheet for all the challenges, credit to itsEnergie! Time to bludgeon your enemies with your pickaxe. This is more easily done in Duos or Squads, but you can also just land on some poor soul in solos and hack away at them as they try to loot a building. Might be kind of difficult, but you can always grab a Baller and plunger around the map. The easiest three might be the one west of Pleasant Park, to the one south west of Tilted Towers, and then to the mountain one west of Fatal Fields. I think this could be the safest to avoid players, but it's going to be random chance. There's no real right order, you just kind of have to get lucky with how people rotate. I would head to an LTM for this one, that would make it way easier. Pirate Camp Locations can be found below! This is a three stage challenge, first you'll go to Junk Junction and then The Block, second to Pleasant Park and then to Dusty Divot, and third to Happy Hamlet and then to Snobby Shores. There's not a lot to doing this one, you'll likely just end up finishing it by playing the game normally. If all else fails, head to the Team Rumble LTM. Snobby Shores might be the easiest spot to do this in terms of not too many people going there. Loot Lake isn't a bad spot to land, but there's a lot of areas where there isn't that many resources around it so you are really out in the open. I'd just land at whichever spot you know the chest layouts for more. This is an interesting one, you'll have to ride on a Zipline and manage to shoot someone while you do this. As far as we can tell, all you need to do is manage to deal at least 1-damage to someone while you are on the line. This stage shouldn't be that difficult, especially if you jump into an LTM. The second part, however, might be a bit more difficult. In this part, you'll need to damage an opposing player who is riding the Zipline. Again, this would be way easier in an LTM because people don't take it as seriously. Pretty simple one, just go to different named locations on the map and get an elimination. 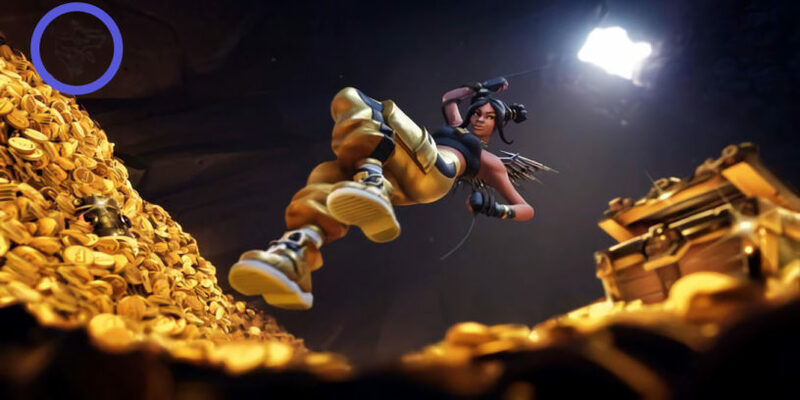 Once you complete all of the week 7 challenges you'll get this awesome loading screen with Luxe heading into a hidden treasure trove! The clue is clearly at the top left of the image, and it isn't obvious what it is at first. If you flip it around, however, you'll notice that it looks like a rabbit with a battle star hanging above it! To find the rabbit, you must head to the very west side of the map, and you'll find the star over its back! What specific locations are you referring to? Which challenge are you referring to? Life of Luxury/All that glitters is gold. Almost typed this with caps lock on. Yeah, but what are the specific locations??? I read this entire thing for that and you don’t name them?